New Gold Inc. (“New Gold”) (TSX and NYSE AMEX: NGD) today announces that it has entered into an agreement with a syndicate of banks to establish a $150 million undrawn revolving credit facility further enhancing the company’s financial flexibility. The facility, structured and arranged by Scotia Capital and Commonwealth Bank of Australia, has an initial term of three years, with annual extensions permitted, and provides New Gold with additional liquidity supplementing the company’s already strong cash position. With the $58 million received from the December 1, 2010 sale of Beadell shares, the company has over $425 million of cash today. The syndicate of lenders includes the Bank of Nova Scotia, Commonwealth Bank of Australia, UniCredit Bank AG, Royal Bank of Canada and JP Morgan Chase Bank, N.A. New Gold is an intermediate gold mining company with the Mesquite Mine in the United States, the Cerro San Pedro Mine in Mexico and Peak Gold Mines in Australia. The company is expected to produce between 330,000 and 360,000 ounces of gold in 2010, growing to over 400,000 ounces in 2012. In addition, New Gold has a strong portfolio of development and exploration assets in North and South America. 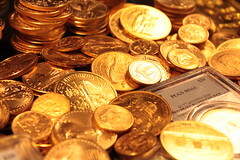 For further information on the company, please visit www.newgold.com. Certain information contained in this news release, including any information relating to New Gold’s future financial or operating performance may be deemed “forward looking”. All statements in this news release, other than statements of historical fact, that address events or developments that New Gold expects to occur, are “forward-looking statements”. Forward-looking statements are statements that are not historical facts and are generally, but not always, identified by the words “expects”, “does not expect”, “plans”, “anticipates”, “does not anticipate”, “believes”, “intends”, “estimates”, “projects”, “potential”, “scheduled”, “forecast”, “budget” and similar expressions, or that events or conditions “will”, “would”, “may”, “could”, “should” or “might” occur. All such forward-looking statements are based on the opinions and estimates of management as of the date such statements are made and are subject to important risk factors and uncertainties, many of which are beyond New Gold’s ability to control or predict. Forward-looking statements are necessarily based on estimates and assumptions that are inherently subject to known and unknown risks, uncertainties and other factors that may cause New Gold’s actual results, level of activity, performance or achievements to be materially different from those expressed or implied by such forward-looking statements. Such factors include, without limitation: significant capital requirements; fluctuations in the international currency markets and in the rates of exchange of the currencies of Canada, the United States, Australia, Mexico and Chile; price volatility in the spot and forward markets for commodities; impact of any hedging activities, including margin limits and margin calls; discrepancies between actual and estimated production, between actual and estimated reserves and resources and between actual and estimated metallurgical recoveries; changes in national and local government legislation in Canada, the United States, Australia, Mexico and Chile or any other country in which New Gold currently or may in the future carry on business; taxation; controls, regulations and political or economic developments in the countries in which New Gold does or may carry on business; the speculative nature of mineral exploration and development, including the risks of obtaining and maintaining the validity and enforceability of the necessary licenses and permits and complying with the permitting requirements of each jurisdiction that New Gold operates, including, but not limited to, Mexico, where New Gold is involved with ongoing challenges relating to its environmental impact statement for the Cerro San Pedro Mine; the lack of certainty with respect to the Mexican and other foreign legal systems, which may not be immune from the influence of political pressure, corruption or other factors that are inconsistent with the rule of law; the uncertainties inherent to current and future legal challenges the company is or may become a party to, including the third party claim related to the El Morro transaction with respect to New Gold’s exercise of its right of first refusal on the El Morro copper-gold project in Chile and its partnership with Goldcorp Inc., which transaction and third party claim were announced by New Gold in January 2010; diminishing quantities or grades of reserves; competition; loss of key employees; additional funding requirements; actual results of current exploration or reclamation activities; changes in project parameters as plans continue to be refined; accidents; labour disputes; defective title to mineral claims or property or contests over claims to mineral properties. In addition, there are risks and hazards associated with the business of mineral exploration, development and mining, including environmental hazards, industrial accidents, unusual or unexpected formations, pressures, cave-ins, flooding and gold bullion losses (and the risk of inadequate insurance or inability to obtain insurance to cover these risks) as well as “Risk Factors” included in New Gold’s Annual Information Form filed on March 26, 2010 and Management’s Discussion and Analysis for the year ended December 31, 2009, both available at www.sedar.com. Forward-looking statements are not guarantees of future performance, and actual results and future events could materially differ from those anticipated in such statements. All of the forward-looking statements contained in this news release are qualified by these cautionary statements. New Gold expressly disclaims any intention or obligation to update or revise any forward-looking statements, whether as a result of new information, events or otherwise, except in accordance with applicable securities laws.